Nikon has announced two additions to its System 1 line, the S2 and the J4. Both cameras are designed for photographers who want to move up from point-and-shoots to interchangeable lens cameras without the weight of a dSLR system. "Possessing the renowned rapid performance of the Nikon 1 System and the ability to instantly share amazing images and HD video, Nikon's newest Nikon 1 cameras are great on-the-go companions for ensuring every unforgettable moment is captured," said Masahiro Horie, Nikon director of marketing and planning. Here's a concise look at the differences between the two models. 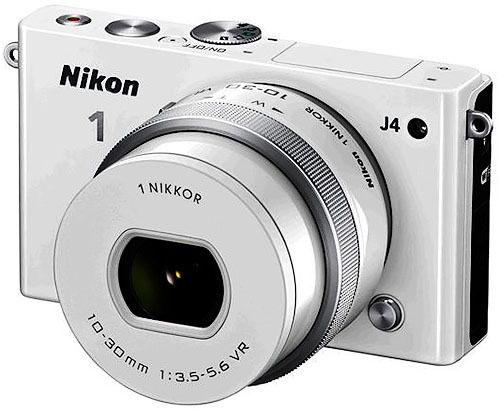 The compact Nikon 1 S2 digicam features a 14.2-megapixel CMOS sensor with no low-pass filter and 20 frames per second continuous shooting with autofocus tracking. The new System 1 camera is designed for first time users, the company said, and will be available in four colors: yellow, white, red and black. Nikon has redesigned the user interface to make it easier to use, adding a Creative Palette to apply effects using the rotary multi-selector. Movie recording captures 1920x1080/60p full-HD movies with Auto Image Capture during movie recording. Fast Motion, Jump Cut and 4-second Movie options are also included. 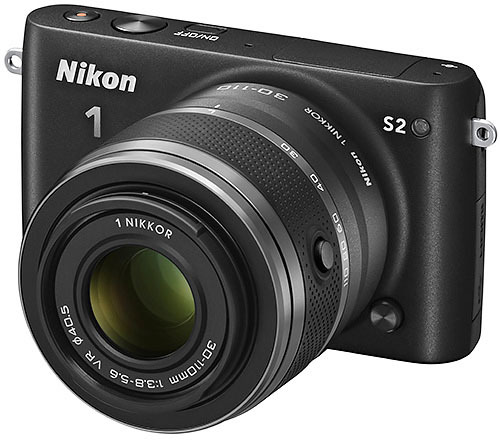 Available in June, the S2 will list for $449.95 with the 11-27mm f3.5-5.6 lens. A two-lens kit with the VR 30-110mm f3.8-5.6 lens will list for $699.95. You can pre-order from Adorama at $446.95 for the 11-27.5mm kit in black or red. The J4 features a new 18.4-megapixel CX-format CMOS image sensor and built-in WiFi for a seamless connection to a compatible smartphone or tablet. The J4 also features a new touchscreen interface with touch shutter functionality "for extremely simple and intuitive shooting." Like the Nikon 1 V3, the J4 can record slow motion movies in HD in 1280x720 resolution at up to 120 fps. Available in May, the J4 with the a 10-30mm f3.5-5.6 PD-Zoom lens will be available in black, white, silver and orange for a $649.95. A kit with the 10-100mm f4.0-5.6 VR lens will also be available for $849.95, according to Nikon (but stores have this at $1,049.95 list). Additionally, a two lens kit including the 10-30mm f3.5-5.6 PD-Zoom lens and VR 30-110mm f3.8-5.6 lens will be available for $1,049.95, according to Nikon (but again stores have this at $849.95 list). You can pre-order at $846.95 for the two lens kit in black, for example, from Adorama or B&H. Nikon also announced new Nikon 1 accessories, including the WP-N3 Underwater Case for both the J4 and S2, as well as the SB-N10 Waterproof Speedlight, further expanding the versatile and growing Nikon 1 System. The new accessories will be available in May but no prices have been determined yet, the company said. More details are in the news release below. MELVILLE, N.Y. -- Today, Nikon Inc. announced the two newest additions to the Nikon 1 System of compact interchangeable lens cameras, the Nikon 1 J4 and Nikon 1 S2; each providing outstanding speed and innovative tools for those ready to take their photography and creativity to new heights. Whether seeking an advanced camera when leaving the dSLR at home, looking to upgrade from a point-and-shoot camera or stepping up from a smartphone, both the J4 and S2 are compact yet feature-packed options capable of capturing beautiful images and HD videos that can easily be shared with friends and family. Also announced were several new Nikon 1 accessories, including the WP-N3 Underwater Case for both the J4 and S2, as well as the SB-N10 Waterproof Speedlight, further expanding the versatile and growing Nikon 1 System. "The new Nikon 1 J4 and Nikon 1 S2 offer the ideal combination of impressive speed, compact size, powerful imaging performance and creative tools that photographers of any level can appreciate," said Masahiro Horie, Director of Marketing and Planning, Nikon Inc. "Possessing the renowned rapid performance of the Nikon 1 System and the ability to instantly share amazing images and HD video, Nikon's newest Nikon 1 cameras are great on-the-go companions for ensuring every unforgettable moment is captured." When a split second means the difference between a good shot and a great shot, Nikon 1 users will appreciate the incredible speed and accuracy offered by both the new Nikon 1 J4 and Nikon 1 S2. Like the recently announced Nikon 1 V3, both cameras feature the world's fastest continuous shooting frame rate at an uncompromising 20 frames-per-second (fps) at full resolution, ideal for capturing split-second moments that can last a lifetime. Additionally, the J4 sports an impressive 171 contrast detect focus areas and 105 phase-detect AF points for incredible autofocus accuracy when capturing either stills or HD video. Both of Nikon's newest Nikon 1 System offerings offer the latest in imaging technologies to help capture amazing moments with crisp detail, even in low-light. The J4 features a new 18.4-megapixel CX-format CMOS image sensor, while the S2 features a 14.2-Mp CMOS imaging sensor. Both employ the new EXPEED 4A image processing engine, capable of rendering family portraits, incredible landscapes or the game winning goal with true colors and amazing precision. When shooting in low-light settings, users can also utilize an increased ISO range, expandable up to 12,800, for better performance without the use of a flash. Recognizing the importance of sharing precious moments, both the Nikon 1 J4 and Nikon 1 S2 allow the user to take amazing photos and HD video and easily share with family and friends via social networks. The J4 features built-in WiFi connectivity that allows the seamless connection to a compatible smart phone or tablet for effortless sharing, while the S2 can provide the same capability via the optional WU-1a Wireless Mobile Adapter. With the J4 and S2, Nikon has also made several enhancements to the cameras' HD video capabilities, as both allow the user to record crisp 1080/60p HD video for up to ten minutes per clip. Electronic Vibration Reduction (e-VR) is also available during 1080/30p and 720/30p video recording, to help ensure smooth and steady movies, even while handheld. Furthermore, both cameras are capable of capturing simultaneous still images during video recording, using the new Auto Image Capture feature that saves full size images automatically throughout recording, saving the 20 best stills for the J4 and 10 best shots for the S2. Slow View Mode is also available for the Nikon 1 J4, allowing the user to slow down the frame and capture each and every moment. Like the Nikon 1 V3, the J4 can also record slow motion movies in HD in 1280x720 resolution at up to 120 frames-per-second (fps). With a wealth of new video features, the Nikon 1 System continues to push the boundaries for video capabilities in compact interchangeable lens cameras. Continuing in the spirit of the Nikon 1 System, the Nikon 1 J4 and Nikon 1 S2 are ergonomically designed and extremely compact, ready to help capture stunning stills and HD video with ease, even during the most fleeting moments. The start-up time for both cameras is incredibly fast to ensure the perfect shot is never missed, while the J4, when paired with the recently announced 1 Nikkor VR 10-30mm f3.5-5.6 PD Zoom lens, is a nearly unbeatable combination when time is of the essence. Additionally, while the Nikon 1 S2 sports the traditional Nikon 1 multi selector for menu access, the J4 features a new touchscreen interface with touch shutter functionality that allows for extremely simple and intuitive shooting. Simply tapping the screen will instantly snap an unforgettable photo. In terms of storage, both new Nikon 1 cameras use Micro SD memory cards. The J4 and S2 bring a wealth of new creative enhancements to the Nikon 1 System that provides the opportunity for users to even further expand their creativity, resulting in a truly customized experience. Both cameras see the return of several popular creative modes from previous models including Selective Color, Miniature Effect and Easy Panorama Mode (exclusive to the J4), but also introduce numerous new creative options for shooting both stills and video. For still images, users can now utilize Cross Process, Toy Camera and Creative Pallet modes, with the latter allowing users to apply effects to a scene prior to capturing an image to help preview how it will affect the photo. Creative Pallet is accessible through either the wheel on the back of the Nikon 1 J4's touchscreen display or by using the multi selector on the back of the Nikon 1 S2. Additionally, ISO Sensitivity Noise Reduction is now available to help render amazing images when shooting at high ISO ranges by "stacking" multiple (4) shots to help achieve clear and consistent photos even in difficult low-light shooting scenarios. Additionally, new video-specific options include Jump Cut, Fast Motion and Four Second Video, further expanding on an already impressive stable of video capabilities. For those who want to take the Nikon 1 System underwater, Nikon has also introduced the new WP-N3 Waterproof Case for use with both the Nikon 1 J4 (with 1 Nikkor 10-30mm f4.5-5.6 PD-Zoom) and Nikon 1 S2 (with 1 Nikkor 11-27.5mm f3.5-5.6). Designed for those interested in deeper diving, without the hassle of bringing a dSLR, the WP-N3 is capable of operating at a depth of 45m (approximately 147.6 ft.), allowing both new Nikon 1 offerings to capture amazing underwater photos and HD video. For further versatility when shooting underwater, Nikon has also announced the SB-N10 Waterproof Speedlight, adding yet another tool to the underwater photographer's arsenal. This new Speedlight is compatible with the WP-N1, WP-N2 and WP-N3 waterproof cases, as well as the world's first waterproof, shockproof and freezeproof compact interchangeable lens camera, the Nikon 1 AW1 (when using the new Fiber Optic Cable Adapter). Waterproof up to 100m (approximately 328.1 ft.), the SB-N10 will help illuminate difficult to shoot underwater shooting scenarios with elegance and precision. Available in May, the Nikon 1 J4, kitted with the 1 Nikkor 10-30mm f3.5-5.6 PD-Zoom lens, will be available in Black, White, Silver and Orange for a suggested retail price of $649.95, while a kit with the 1 Nikkor 10-100mm f4.0-5.6 VR lens will also be available for $849.95. Additionally, a Two Lens Kit including the 1 Nikkor 10-30mm f3.5-5.6 PD-Zoom lens and 1 Nikkor VR 30-110mm f3.8-5.6 lens will be available for $1,049.95. Available in June, the Nikon 1 S2, kitted with the 1 Nikkor 11-27.5mm f3.5-5.6 lens, will be available in Black, White, Red and Yellow for $449.95, while a Two Lens Kit including the 1 Nikkor 11-27.5mm f3.5-5.6 lens and 1 Nikkor VR 30-110mm f3.8-5.6 lens will also be available for $699.95. The WP-N3 Waterproof Case, SB-N10 Speedlight and Fiber Optic Cable Adapter will be available in May with final pricing to be determined.